We offer white papers in order to share our experience on geomarketing and mobile workforces for your different activities. Specific needs, good practices, feedbacks... Those documents will help you in your geographical optimization process. All those resources are in free access. We only ask you your contact details before you can download it. 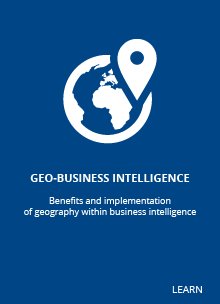 Context, how geography helps Business, definition and benefits of Geo-BI, how to implement Geo-BI.. This white paper aims to identify the chain of oprations involved and establish the broad principles of the solutions that make it possible to optimize mobiles sales force efficiency by better managing the territorial aspects of movements and business organizations.